Also, many families are choosing to scatter the cremated remains of their loved one in a favourite place; the ocean, or even in the skies above. While that may seem fitting at the time, it means that you do not have a consistent place to connect with the memories of the person you loved so dearly. 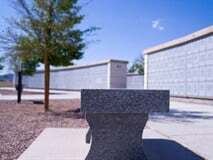 A permanent place to reflect on your loved one becomes a way of connecting to a family's past. Visiting the resting place of grandparents or great-grandparents may provide children with an anchor to their personal history. It is a connection to the past, to love shared. It truly honours the relationship you still have – and will always have – with that person.